Street vendors were a huge part of the cultural life of all great cities. Hot meat pies in London, chestnuts in Paris, cockles and mussels in Glasgow, halva and sweet cakes in Istanbul. 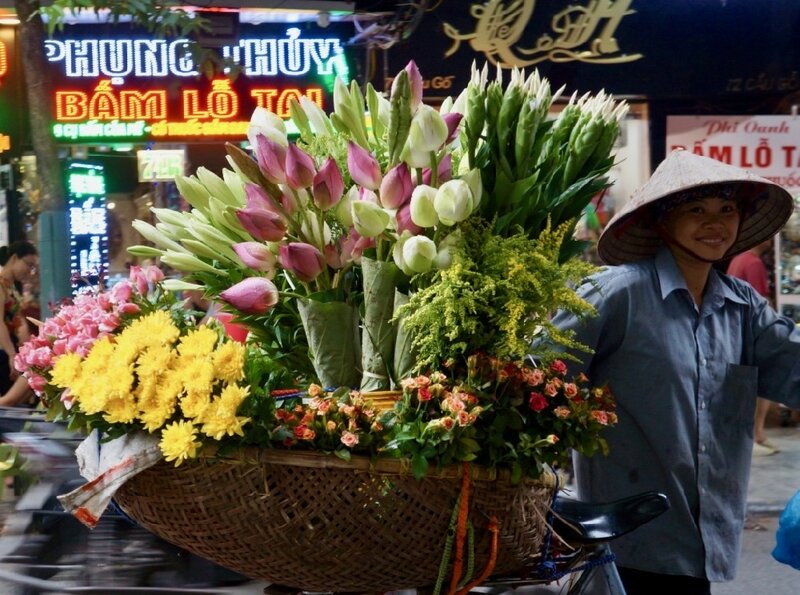 In Hanoi, street vendors brought the world of inexpensive food to the corner of your street and sometimes to your front door. Although very much gone for years in most of Europe and the west, nowadays, food trucks and farmers markets have captured the foodie imagination and people once again have flocked to eat in the streets and buy produce from the street stalls. In most of Asia, especially here in Hanoi, the street vendors are a colourful part of street life everywhere. 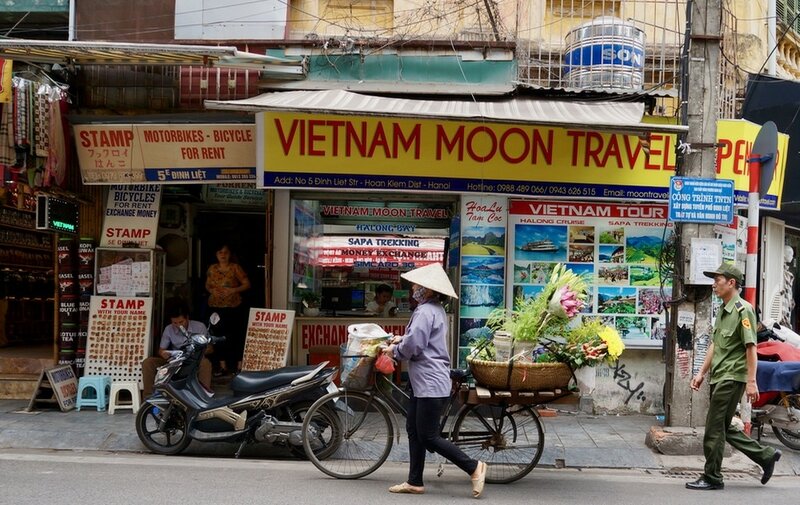 The Hanoi street vendors don't really have the usual taped calls to buyers as in Phnom Penh where these have become part of the literature of most western nations and their humour and watchfulness made them warming figures for many. 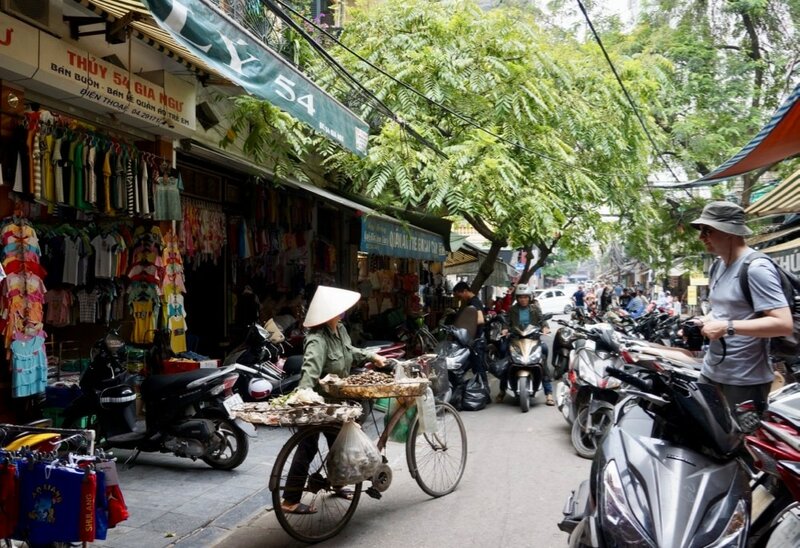 Here in Hanoi, the street vendors are easily visible in their Vietnamese hat, bicycle or some walking on foot with their cargo balanced on their shoulders. 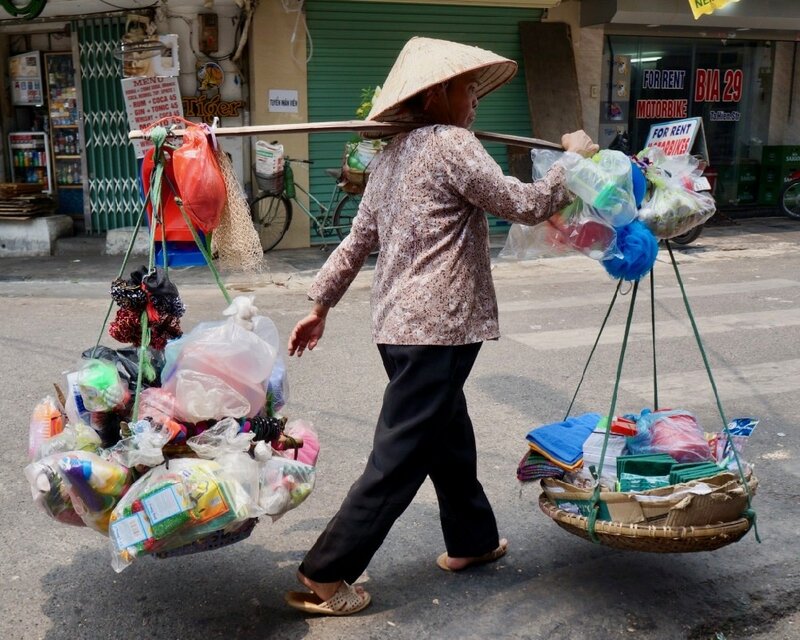 Often, a lone woman vendor sitting by a traffic light or walking with her large rattan basket or carrying an entire kitchen and dining room over her shoulder is just the visible end of a big family enterprise involving all the grannies to aunties and babies in the family or even in the entire building. The story of street vendors is often overlooked especially by tourists who see them as only one level above beggars or poor unwashed people selling unhealthy snacks. What a pity. For real travellers, for whom all movement is an adventure, the street vendors are the fastest and happiest way to not only taste the unique joys of the local culture but to make an instant and direct investment in women's lives. ​Some of these vendors leave their families in the rural areas and earn a living in the city. They rent bed spaces and start work very early as early as 2:30 a.m. when they go to the wholesale markets to buy what they have to sell. While we love to get a good bargain, let's think how difficult it is for many of these vendors to bring your daily needs right at your doorstep.